Get ready to revisit the world of Wakanda in this new featurette for Avengers: Infinity War. The biggest Marvel Cinematic Universe movie ever is just around the corner and the hype levels have reached critical mass. 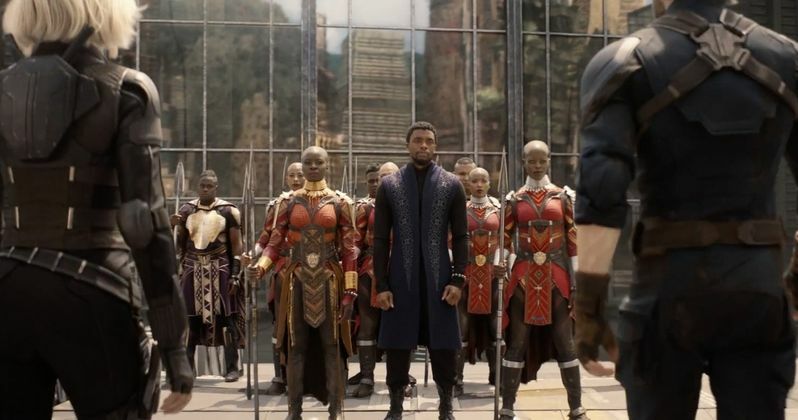 If you're sitting at home just counting the minutes until the movie arrives, perhaps taking in this new, very cool featurette about returning to Wakanda will help tide you over, as it features a ton of footage from the movie, as well as some behind the scenes stuff and interviews with the cast and filmmakers. Black Panther properly introduced us to the world of Wakanda just a few months ago, but T'Challa's homeland is set to be a major location in Avengers: Infinity War and this featurette takes a look at how the country is going to factor in. Aside from getting some context, there is a ton of footage crammed into this video, which is just under two minutes in length but does a lot to get fans hyped. Also, much like the rest of the Infinity War marketing, the studio has done a great job of seemingly not giving too much away. So this will help whet your appetite without ruining any of the big surprises in store. Marvel hit a serious home run earlier this year with Black Panther. The movie has been met with near-universal praise from both fans and critics, which has helped propel it to more than $1.3 billion at the global box office. That makes the timing incredibly convenient, as those who are looking to get some more of a Black Panther fix are clearly going to be able to get a serious dose of Wakanda in Avengers: Infinity War. It was impossible for Marvel Studios to predict Black Panther's success, but this still worked out impressively well for them. Not that people wouldn't be flooding theaters to see Infinity War anyway, but the hype surrounding Black Panther could help put that extra cherry on top. The MCU has been an unprecedented cinematic journey ten years in the making that is set to culminate with Avengers: Infinity War. This movie brings to the screen the ultimate, deadliest showdown of all time in the form of Thanos vs. The Avengers. The heroes of the MCU must be willing to sacrifice everything in an attempt to prevent the Mad Titan from "balancing the universe." In other words, once he gets all of the Infinity Stones, he's going to kill lots and lots of people. While the world doesn't know who is going to bite the dust just yet, it's clear that characters we know and love are going to die in Avengers: Infinity War. It's about to get very real. Odds are, quite a few are going to eat it in that epic battle sequence in Wakanda that we keep getting teased with. Be sure to check out the new Wakanda Revisited featurette for Avengers: Infinity War, courtesy of the Marvel Entertainment YouTube channel, for yourself below.